Home Improvement 6008-If you think this is a decorative do-nothing wishing well for the yard, look again. It's a cookout center for the chef. Pre-fabricated Bar-B-Q unit has cooking grate, firebox and ash dump. Slate counter offers workspace. Inverted bucket shields light bulb. Well, 3' square, is 6'- 6" high. Home Improvement 6014-Get ready for the barbecue season by building this cookout center. Designed to fit into a corner of your yard, the unit centers a prefabricated cooking grate with ash pit and firebox between two long counters where your favorite chef can prepare his specialties. Underneath the counters, cabinets store a host of supplies where they're easy to get at. Flue at rear carries smoke from the firebox away from the cooking area. Use slate counter tops for a touch of color plus easy maintenance. Build unit of brick or, for economy; use concrete blocks with stucco finish. Unit is 3 feet high; 8 feet long from center rear to each side. Home Improvement 5024-Here's a barbecue center that will add charm to your garden and make your chef feel like a VIP. For economy, the barbecue unit is built of concrete block. Adjacent full-height cabinet stores garden tools or trash can. Counter-high cabinet with redwood top, left, stores dishes, barbecue utensils, glasses, cups etc. Unit roofed for weather protection is 9 feet, 4 inches wide; 2 feet, 8 inches deep; 8 feet, 4 inches high. Home Improvement 1677-The chef may beef about beef prices, but the cooking is easy on this concrete-block barbecue with two wooden storage cabinets. Garden tools and trash can go at left and cooking utensils and dishes are kept under counter. Complete unit is roofed over to protect from weather. Blocks are stuccoes and wood is stained or painted. Width is 8 feet, 4 inches; height 6 feet, 4 inches; depth is 2 feet, 8 inches. 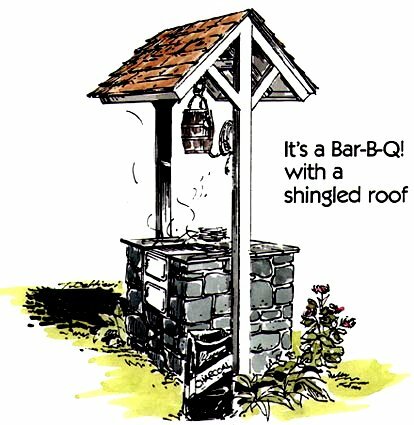 Home Improvement 6026-Equip the yard for summer and storage with a combination barbecue and shed built under one roof. Shed has two storage areas with doors opening on each side. Redwood work counter is handy to the barbecue, which is built of concrete block for economy. Barbecue-shed unit is 6 feet, 6 inches wide, 5 feet, 5 inches deep; 6 feet, 4 inches high.